Taking the trolley around Crater Lake is one of the activities offered at Crater Lake National Park. Based out of Klamath Falls, Oregon, the Crater Lake Trolley has provided tours around Crater Lake for nearly two decades. They have three trolleys that leave on the hour starting at 10:00am through 3:00 pm during July and August ... with other hours in June and September. Check their website, Crater Lake Trolley, for full schedules and reservations. The tour is 2 hours long and makes many stops along the way: for our journey they made seven stops where we could get out, see the sites, take photos, and listen to the Park Ranger Guide explain what is interesting and historic. I would expect that not all trolleys make the same stops, but the Driver and Ranger Guide make the tour informative and enjoyable. The trip takes a clockwise journey, with the Ranger sharing details of Crater Lake and answering questions from the passengers. The driver and guide take good care of the passengers helping them on and off the trolley, and making sure all are back on the trolley before leaving a stop. Ann was our driver, and Carl was our Ranger Guide. Our first stop was Wizard Island Overlook, where there's a grand view of this island cinder cone. It formed after the collapse of Mount Mazama, while the lake filled with rain and snow melt. The animals on the island made their way across a land bridge, which flooded as the lake rose, leaving them to develop as unique sub-species. The island is accessible by shuttle boat and has a trail leading to the top of the cinder cone, where you look can look into the 90 foot-deep crater. Our stop at the desert view turnout gave us a good view of Mount Thielsen, which is a lightning rod for the area according to Carl. It is outside the park, but it has a trail-head on highway 245 just opposite Diamond Lake. In the middle of the scene is the Pumice Desert. It is brownish and is absent of any vegetation, except for a few hardy trees. The Pumice Desert has a viewpoint along the north entrance of the highway. The snow-covered mountains on the left in the background are the Three Sisters volcanoes, which are about 90 miles north of the viewing point. The Devil's Backbone is a wall of volcanic rock that was formed by molten lava being forced up into the crevices of the volcano. When Mount Mazama blew its top, the wall of hardened lava was left exposed. The Devil's Backbone structure is a volcanic dike, and it is the only one that hasn't eroded. Therefore, it is studied to learn more about this volcano. It is visible from the surface of the lake up 1000 feet to the top of the rim. Also during our stop, we caught a view of a tour boat headed toward Wizard Island. There are several boat tours available, and they are the only way to get on the lake unless you're a ranger or a researcher. At this stop we were able to look down the crater wall to see a couple of boats, which appeared very small from the top of the rim. Crater Lake draws researchers in from around the world to study this pristine lake. It is the deepest lake in the United States at 1,949 feet. In the past a submersible Deep Rover surveyed the bottom of the lake. After two years of study with Deep Rover, they studied only 7% of the lake bottom. Standing at the top of the rim and looking down, you see crystal clear water falling off into a deep blue abyss. We also learned that lava rock is rhyodacite, which is a composition between rhyolite and dacite. 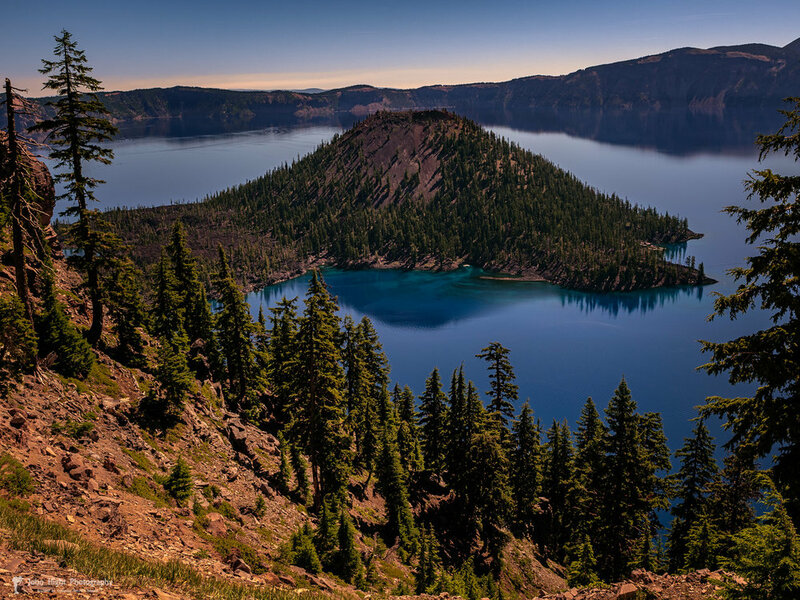 Volcanos with rhyolite magmas tend to be very explosive, which gives some explanation to what happened 7,700 years ago when Mount Mazama blew its top off ... creating a crater which is now Crater Lake. In contrast to the massive & dense lava rock was the pumice scattered around the stone. It was very light in weight, and Carl told us that it would float. Judging by its weight I would say he was right. Carl further explained that the walls of Crater Lake are a mixture of lava rock and pumice, with the pumice acting as mortar holding the lava rock together. This formation of a pumice outcropping reminded me of the hoodoos in Bryce National Park, but that is where the similarities stop. Pumice Castle stands 1,300 feet above the lake surface. A thin layer of lava on the top of the pumice protects part of the pumice, and at the breaks in the lava rock the pumice has eroded away forming columns. This stop is at Kerr Notch, and it offers a spectacular framed view of Phantom Ship. This small island is around 300 feet long with a maximum width of 200. The ridge of spires stands 163 feet above the lake surface creating a ship-like appearance, with the spires being the tall masts of this mighty vessel. With a closeup view, we see the island supports some trees: 7 of the species found in the park grow together . They aren't found together in the rest of the park ... making this little island a tree sanctuary. The last stop on our tour, Vidae Falls, was just off the rim highway and offers a picnic area for those brave enough to deal with the mosquitoes that greeted us as we stepped out the trolley. The water for the falls does not come from the lake, but from stored water in the pumice-rich slopes of Crater Lake's wall. Standing at the falls you enjoy the sounds and scents of a waterfall, so it was a very refreshing final stop on our tour. From the last stop, the trolley took us back to the Rim Village where it originated, bringing our two-hour tour to an end. We did thoroughly enjoy the journey and would highly recommend it if you're planning to visit Crater Lake National Park. You'll receive a lot of interesting information from the Ranger Guide, Carl, and great detail on the stops of the tour ... along with additional suggestions of places to visit on your own. The ride is comfortable, with cushions provided to sit on the wooden benches (which also keep passengers from sliding around on some of the hairpin curves). Our expert driver, Ann, navigated the narrow and winding road, allowing full enjoyment of the fantastic scenery of Crater Lake National Park. Thank you for reading my blog on "The Crater Lake Trolley Tour"! Visit NPS website for Crater Lake.